This soft, breathable anti bed bug crib mattress encasement is designed to prevent bed bug infestation and is also treated with anti-microbial protection, hypo-allergenic and anti-bacterial components. 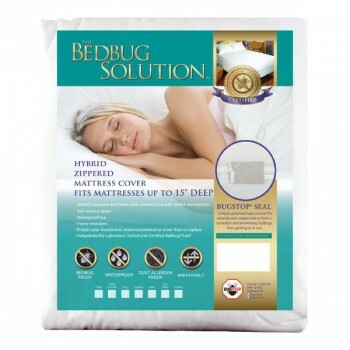 It’s impermeable, which helps to stop the penetration of bed bugs through the fabric. With our zipper technology, you can be sure the encasement remains effectively on the mattress. This anti bed bug crib mattress encasement is safe for your little one and removes easily for washing. There is nothing in the world worse that a threat to your infant child. Bed bugs are a real and serious threat that requires a real and serious solution. Make sure to protect your child’s crib mattress from bed bug infestation by using our SecureSleep™ crib mattress cover. It’s an important part of any bed bug prevention effort. And, if you already have bed bugs, it’s a key part of an effective pest management plan. With our top quality crib mattress protection, bed bugs are prevented from infesting your child’s mattress! It’s easy to install and entomologist tested, with outstanding features like scientifically designed and patent pending Zip Tech™ zipper technology, with 3-way protection and re-enforced seams. Also, unlike some products which just cover the top of the crib mattress, leaving the rest exposed (much like a fitted sheet) SecureSleep™ crib mattress protection fully encases from top to bottom. 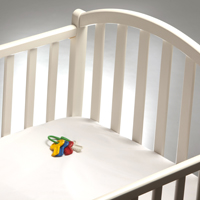 Plus, our crib mattress cover has a PVC interior lining, ensuring that it’s long-lasting and durable. And, as a responsible company with children of our own, we are pleased to assure you there are no pesticides of any kind used in our crib protectors, providing your infant child with a safe, healthy and secure sleep environment. Provide your Infant Child with A Healthy Sleep Environment! While bed bug protection is the key element in our product, we are also pleased to provide several other important benefits to your infant child to help you keep them healthy. The sleeping environment is such an important part of your child’s healthy development! Our products provide a dust mite barrier and keep bio-fluids away from the mattress as well. These elements can build up inside an unprotected crib mattress and create a dangerous mixture of allergens in the worst possible place — right where your baby lays down his or her head and sleeps. SecureSleep™ crib mattress protection keeps it all away for your baby, providing a clean, comfortable and safe sleeping environment.